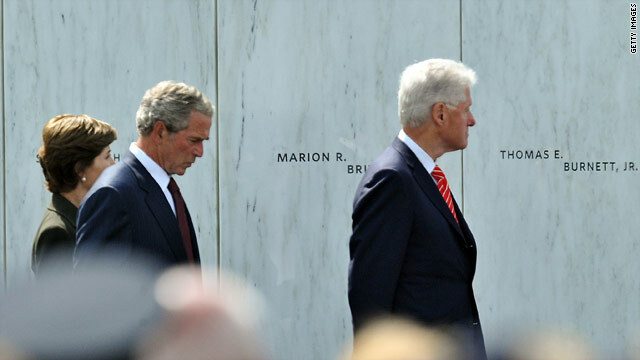 (CNN) – Former Presidents George W. Bush and Bill Clinton spoke solemnly Saturday at the unveiling of the memorial for victims of United Airlines Flight 93. “With their brave decision, they launched the first counteroffensive in the war on terror,” said Bush, who appeared emotional as he spoke near Shanksville, Pennsylvania, to families and friends of those who died in the crash. All 40 passengers and crew members were killed after confronting hijackers aboard the Boeing 757 on the morning of September 11, 2001. The hijacked plane, widely believed to be targeting the White House or the U.S. Capitol, crashed in a field outside Shanksville. Bush, who served as commander in chief when the United States went to war in Iraq and Afghanistan, said 9/11 proved that conditions in other countries could have an impact in American streets. “It may be tempting to think it doesn’t matter what happens to a villager in Afghanistan or a child in Africa, but the temptation of isolation is deadly wrong,” Bush said. He also told stories of unity in the days that followed the September 11 attacks and spoke to the intense political debates that have shaped Washington over much of the past decade. After ending his speech, Bush quickly walked back to his chair and sat down, while the audience gave him a standing ovation. Clinton, vividly emotional, then walked to the podium to begin his speech but struggled to get through his first few sentences. “Before President Bush came up to speak, I asked him if he was having a hard time, and he said, ‘I was doing fine until I looked at all of you’,” Clinton said, pointing to the audience. In a speech laced with similar themes of unity and resilience, Clinton credited Bush and President Barack Obama for preventing another attack on American soil in the last decade – a statement that was met with strong applause. “There has always been a special place in the common memory for people who deliberately, knowingly, certainly lay down their lives for other people to live,” Clinton said, referring to the victims of Flight 93. Clinton, whose term ended just nine months before the attacks, compared the acts on the plane to the Battle of the Alamo, as well as the Spartan offense against the Persian Empire 2,500 years ago. Both stories involved a small minority fighting against the odds for a larger cause. “And 2,500 years from now, I hope and pray to God that people will still remember this,” Clinton said. The former president closed his speech by announcing that he and House Speaker John Boehner (R-Ohio) had agreed to hold a bipartisan event to raise more money for the memorial. I am in my early 50's, my boyfriend 10 years older. We both live in Pittsburgh, through a lot of encouraging, I talked him into making the trip I had already made on a couple of occasions, the trip to Shanksville. Sadly by the time we'd gotten there, both former presidents had spoke and most likely were being hustled back to their transportation back home. Yesterday (9/10/2011) had a couple of noted dichotomous message. At the time of our arrival there, the road leading back to the impact zone had been closed off for about an hour, my boyfriend chose not to wait for it's re-opening, so we returned to Pittsburgh. I thought of the ugly, hate driven mindset that led to the events of flight 93, and the other attacks that fateful day on our trip back to Pittsburgh along the gorgeous Lincoln Hwy., also known as Hwy. 30. What a stark contradiction that day on 9/11/2001 in Shanksville, Pa.; the splendid beauty of the Laurel Highlands, the bravery of the passengers and crew of Flight 93, and unadulterated hate The day of 9/11/2001, a day that shaped a generation. My boyfriend's and my generations have been shaped twice within our lifetime, the first being Viet Nam, the second being 9/11/2001. Why did he want to leave so soon after arriving to Shankstown..., he said death after awhile gets very obscene to look at. where were you when the world stopped turning ? It is sad, very sad as we remember today the supreme sacrifices Americans paid in defense of their fatherland. Many non-Americans, President Obama said, from 90 nations, also perished on that day. We all lost one person or the other; one limb or the other to that ignoble events. We have since killed many in the bid to rid the world of extremism and terrorism. Can we all reconsider, as we remember, just like yesterday, if all these wanton destructions worthy it? Is humanity not worth more than one ideologue and his or her personal predilections? Are the innocents that died about those aircrafts, on land in the WTC, Afghanistan, Iraq, etc nor another persons' sons and daughters? They could be yours, for all you know? Would you not have preferred a more safer and better world for them? Let world leaders, terrorists, and rebels know this: the bell tolls for them too. We will forever miss the dead, we will hold dare and cherish the courage and sacrifices of our men and women who lost lives and body-parts in mortal combats; we will humanity never experience this again. We vow not just to defend this, but also to see that nothing changes our resolve. It is unbelievable how Bush and Cheney managed to get away with it after all this time. We all know the CIA, FBI, NSA knew of the plot in advance, and no one did antything to prevent it. This inside job was Bush's justification for a tentative new American role in the Middle East. I am ashamed that Bish orchestrated these events. There is also no proof whatsoever that Flight 93 really crashed in Shanksville PA. I will never forget 9/11. It changed everything. It changed the way I view Islam as well. After 10 years of researching Islam I can say that I do not feel more safe at all even though it has been exposed. We must do more to remove the hatefull verses out of the quran that are being taught to young Muslims... This is the key to changing the future. The Shrub should be in PRISON instead of walking free and especially not speaking at this honorable event. The Shrub is a disgrace to America and has brought much disgrace to America. He is a very Evil, Greedy, and Dishonest Liar. Very nicely done . Mr Bush's quoting Mr Lincolns' Gettysburg Address was truely fitting. Bush come out from under his rock. @seceding – you are so right. Biden's speech was extremely moving and it did come from the heart. I am glad to see all thepPresidents together. here and there and everywhere, for this tenth anniversary of a day that we will never forget. I knew a person on the flight that slammed into the Pentagon.